James McAvoy and Daniel Radcliffe both turn in top-notch performances, but they aren’t enough to make this film worth watching. McAvoy’s outsized talents are downright wasted with this clunky material, and that’s enough to make me mad. To hold a grudge, even. I’m an epic grudge-holder. But first, let me say this: I find myself once again calling out Daniel Radcliffe for an outstanding performance. I never watched Harry Potter, but out of the goodness of my heart, I don’t hold it against him. He did a very difficult thing: he grew up in front of us, and he did it in the most type-castiest of roles. And yet he’s managed to turn himself into a notable and note-worthy grown-up actor who consistently makes interesting choices. In Victor Frankenstein, he takes on the role of Igor, usually a one-note sidekick, and gives him a fresh and humane spin. Igor becomes the voice of reason, and of humanity as Frankenstein slowly loses his in the pursuit of creating life where it didn’t belong. You all know the story of Frankenstein and his monster. It’s grosser than ever in this movie, but it’s not exactly new. It’s trying to be steampunky and superheroic with its cool quirk and over the top action sequences, plus some horror notes just to thicken the sauce. You can get a whiff of all these ingredients, which is what makes it all the more frustrating when the recipe fails to cook up anything palatable. With every jolt of electricity they send through the monster’s dead body parts, you kind of wish some of the sparks would light up the movie. It’s got a beating heart but not much of a brain. 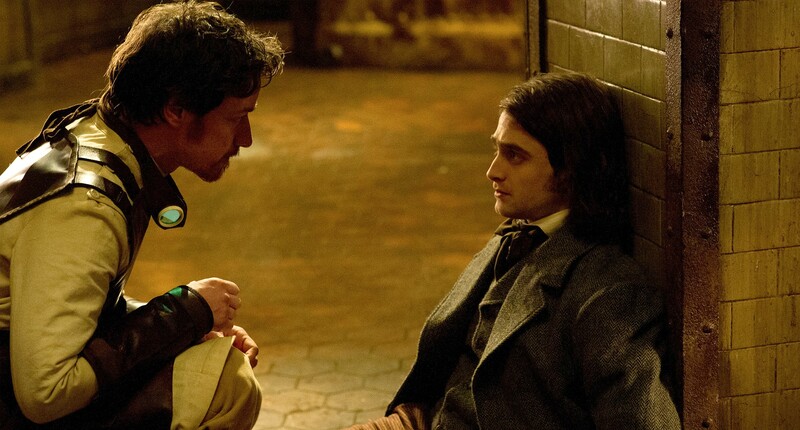 McAvoy’s mad scientist and Radcliffe’s sympathetic servant deserve a better medium than this, but you get the sense that the writer and director were ambitious beyond their means. It never quite pulls together. This is one story that was better off not being reanimated. This entry was posted in Movie Reviews and tagged Daniel Radcliffe, Half-assed, James McAvoy, monster movies on July 11, 2016 by Jay. Aw, it’s a shame this was’nt up to scratch. Radcliffe is definitely making interesting choices to get away from the Potter movies. This is really a shame. I agree with you that Daniel Radcliffe has been making some really interesting choices, both on screen and in plays with Equus and How To Succeed In Business. I was thinking he’d have interesting chemistry (ha!) with McAvoy, but hopefully they’ll get better material in a future project together. They’re good but you kind of want to see them having fun together and unfortunately the material’s just too up and down, it doesn’t give them anything consistent to run with. Too bad. 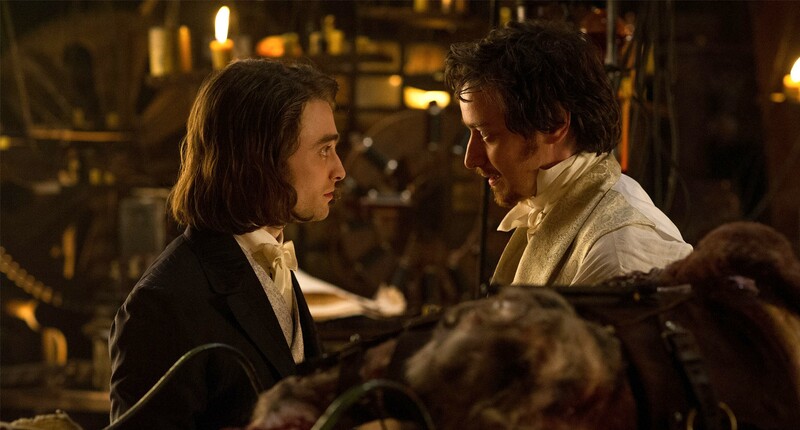 The very fact that Radcliffe was cast as Igor–the very fact that Igor is not, at least from the looks of it, portrayed as a hunchback with a speech impediment–gave me hope that there’d be something special about this latest Frankenstein. Not that I have anything against the way Victor’s assistant–originally called Fritz–is portrayed in the James Whale films or, for that matter, Marty Feldman’s brilliant interpretation of the role. He’s slightly more hunch-backed than you’d think but yes, he’s on better footing. In fact, with Radcliffe in the role, it felt like Igor was too good for the movie which never measured up. It seemed to try too hard to compete with super hero movies action-wise so likewise forgot to include an interesting story or characters. I enjoyed it, but I do agree that it could have been tightened up a bit here and there. Sounds like these two talented actors deserve a better movie. I saw this movie the way I believe it should always be viewed: for free on a plane. I will watch anything with Radcliffe in it, but I’m thankful international travel spared me the additional cost of a ticket for this one. Bah. I’m disappointed that this has turned out to be a waste. Oh well. I’ve never been a big fan of the Frankenstein story, so this won’t be a big loss to me. Being a devout Tolkien worshiper I never watched Harry Potter. I am extremely thankful for that now because I don’t have to slog through all of that to see if DR is a good actor. I don’t know about this movie, though. Maybe I’d rather see the one where he’s a dead guy… We’ll see, though. I love James McAvoy in anything. I love him too, and I’m beginning to realize that I quite adore DR. This movie was awful, I was disappointed because I like the leads so much. It was just awkward to watch, like the whole thing was staged funny.